Air Force photograph by Tech. Sgt. Vernon Young Jr.
Wayne Strube, a former Air Force security forces patrolman, coaches Army Staff Sgt. Lennis Lebarge as he rehabs his right knee with the Delfi machines BFR tourniquet at the Center for the Intrepid at Fort Sam Houston, Texas, Sept. 13, 2016. The BFR tourniquet reduces blood flowing from the specific body part and expedites the healing process. Strube currently serves military service members as the CFI physical therapist in charge of the Return to Run program. Not long after receiving innovative care for serious combat-related injuries, 2nd Lt. Marc Esposito gave his future wife a tour of the unique rehabilitation center that helped the Air Force special operator get back to jumping out of planes. 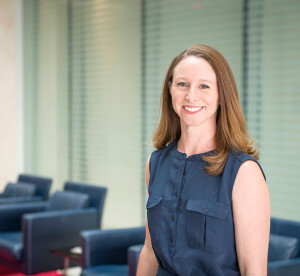 The state-of-the-art setting cast with advanced technology inside the Center for the Intrepid at Fort Sam Houston, Texas, impressed Elizabeth Russell Esposito so much that she took a job there. Following the tour in 2011, Marc recalled that Elizabeth, now married and having a son together, was extremely excited to be part of the center’s out-of-the-box thinking. With an emphasis on getting military members with traumatic injuries back on duty, the facility, which opened in 2007 after more than 600,000 donors pitched in $55 million to build it, uses holistic care and research to support them. In the center’s Military Performance Lab, where Elizabeth does research, a patient can undergo therapy in the Computer Assisted Rehabilitation Environment, a 300-degree screen inside a 21-foot dome that displays virtual reality scenarios from combat situations to everyday life. Nearby, staff members can track body movement in a gait lab that has a 26-camera system using infrared light to follow reflective markers on a patient’s body, along with force plates in the floor to measure the torque that their muscles or prostheses create. Research with this technology and other sophisticated equipment found throughout the center works toward one goal — advancing clinical care. “If you don’t do the research behind it, nothing necessarily changes,” Elizabeth said. “You can’t show that anything in particular is working. 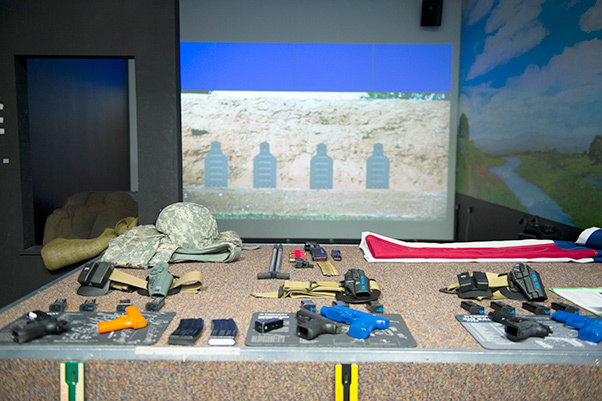 The Center for the Intrepid fire arms simulator provides service members that are recovering from traumatic brain injuries and amputations with a state-of-the-art indoor range on Fort Sam Houston, Texas, Sept. 13, 2016. The simulator provides tethered weapons, without live rounds, compressed nitrogen while simultaneously serving as a practice range for warriors that need the training for potential return to active-duty status. For many patients, the treatment allows them to return to the military and regain the normalcy they may have lost. Marc, 32, battled through a long, difficult process to return to the Air Force ranks, where he has spent the last dozen years. In 2009, Marc, a combat controller at the time, was manning an M240 machine gun in the back of a Humvee when it hit a roadside bomb in eastern Afghanistan. The blast catapulted him from the vehicle into a cloud of smoke before being slammed to the ground. Unconscious for a few days, he finally came to in a hospital bed at Landstuhl Regional Medical Center in Germany, where he was treated for severe burns and broken bones in his legs, feet and back, as well as a traumatic brain injury. Despite his condition, he was more worried about the rest of his crew. “That’s the first thing that goes through your head — what about the team? Are they OK? I didn’t know if the guys I was with were alive or dead,” Marc said, adding that three of his teammates were also seriously injured but would survive. 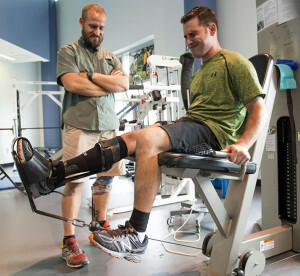 Wayne Strube, a former Air Force security forces patrolman, wears a customized Ideo brace that helps him rehab at the Center for the Intrepid at Fort Sam Houston, Texas, Sept. 13, 2016. Strube currently serves military service members as the CFI physical therapist in charge of the Return to Run program at San Antonio Medical Center, Texas. The CFI Return to Run program is currently servicing active-duty service members and some civilians that have been injured in accidents. After treatment at other sites, Marc spent almost a year doing therapy up to six hours a day at the Center for the Intrepid as staff members motivated him to break through his physical limitations. Frustrated but not deterred, Marc swallowed his pride as he tried to prove them wrong. “One of the most discouraging moments in my recovery was asking for help to walk again. I literally couldn’t remember how to walk down stairs,” he said. Over time, small successes in therapy rolled into a big payoff when Marc was declared fit for duty. 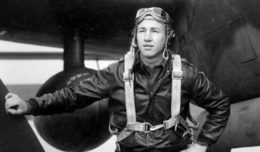 Later, he earned an Air Force commission and now works as a special operations officer for the Battlefield Airmen Training Group at Joint Base San Antonio-Lackland, Texas, where he uses his experience to train the service’s elite ground forces. Recalling his time at the Center for the Intrepid, he compared his treatment to a developmental approach his unit carries out when molding trainees. 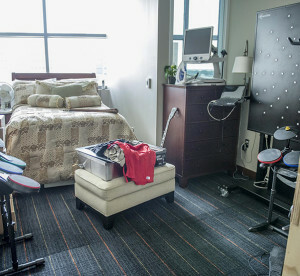 A customized room given the name “Independence Way,” is stocked with adaptive equipment designed to ease the transition for service members suffering from traumatic brain injuries or amputations at the Center for the Intrepid on Fort Sam Houston, Texas, Sept. 13, 2016. Service members are provided assistance with equipment inside of these rooms as they prepare for new challenges in life. That’s the happy ending Army Lt. Col. Kathleen Yancosek, the center’s director, hopes for when a new patient walks through its doors. But when that goal can’t be reached, a patient can always serve in another way. While injuries may bind some wounded military members to assistive devices, they don’t necessarily cap their opportunities. And there’s proof of that. U.S. Rep. Tammy Duckworth, an Illinois congresswoman, lost both legs when her Army helicopter was shot down in Iraq. Former patients have also competed in the Paralympic Games, while others have become business owners or local leaders trying to improve their communities. At times, patients are even used as case studies in research being done at the center, which has been awarded roughly $50 million in research funds since it started. “It breeds confidence in the patient because they know we’re using their recovery as a way to build the science for the next patient that comes through,” the director said. 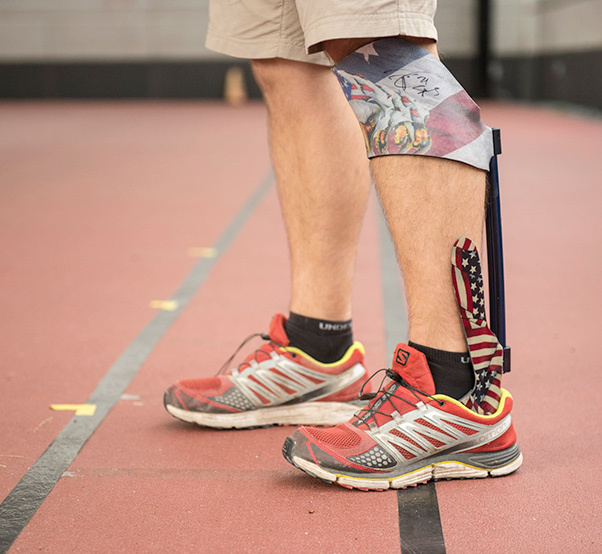 Research mainly focuses on biomechanical studies, with a lot of attention on the Intrepid Dynamic Exoskeletal Orthosis (IDEO), an energy-storing orthopedic device that helps patients with leg injuries get back to running shape. Wayne Strube, a physical therapist in charge of the center’s Return to Run program, has patients wear the IDEO brace while exercising. While he often hears patients recovering from painful injuries complain about the exercises, he said their faces light up when they start running again. Strube, a former Airman who served six years in security forces, also shows patients how to repair their damaged muscles quicker with blood flow restriction training, a strength building technique based on the Japanese method of Kaatsu. The training limits blood flow from an injured limb using a specialized tourniquet during low-weight strength training. As a result, muscles can’t recover as fast since they think they’re lifting more weight. It also tricks the brain in releasing human growth hormones at a higher than normal rate. The practice has gained much popularity in the fitness world that even professional sports players are adopting it. Elizabeth Russell Esposito, the Center for the Intrepid military performance lab biomechanist, works to create unique ways for military service members to cope with traumatic brain injuries and other injuries sustained during service at the CFI at Fort Sam Houston, Texas, Sept. 13, 2016. Esposito’s husband, Marc, is currently a special operator who was treated at the center after he suffered severe combat injuries in 2009. “You can lift really light weight and do a tourniquet that’s not at 100 percent of your blood flow restriction and you gain tons of strength quickly. It helps you put muscle on. It basically just cheats the system, which is pretty cool,” he said, adding that there’s also less wear and tear on the body. In recent years, the center has had to shift gears as fewer troops get hurt in combat. Originally tailored for amputees, limb salvage patients and burn patients in the military, the center has broadened its scope and opened its doors to more civilians. 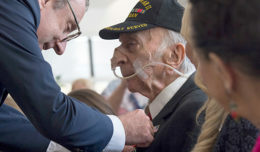 The center made an agreement with the Department of Veterans Affairs to see their patients, and Brooke Army Medical Center often sends patients from the San Antonio area across the street to them. “We’ve been filling up our plate with trauma patients from the city, veterans from the South Texas VA and also seeing more post-op orthopedic patients,” Yancosek said. Motivation is a priority at the center. While many military patients already have a driven spirit, the staff keeps it going. For Marc, the extra motivation being pumped into the air by the staff also had a big impact in his recovery.